Heat oven to 350°F. In large bowl, mix brownie mix, melted butter, egg and water until well blended. Stir in candy sprinkles. Let stand 15 minutes. Shape dough into 21 (1 1/2-inch) balls. Place 2 inches apart on parchment-lined large cookie sheets. Press each ball slightly to flatten. 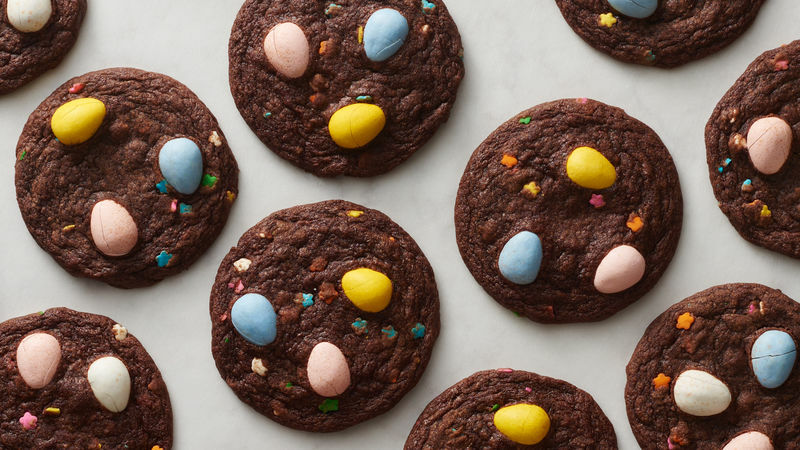 On each cookie, press 3 Cadbury™ mini eggs in center, reshaping if necessary. Bake 9 to 11 minutes or until edges are set (center will appear slightly wet). Cool 5 minutes; remove from cookie sheets to cooling racks. Cool completely on cooling rack, about 30 minutes. Store covered in airtight container. For best results, be sure to let cookie dough rest for 15 minutes before shaping into balls. To avoid overbaking, bake just until edges set on cookie.